iPhone 5 is kambing !!! A batch of new photos of a device said to be Apple’s next-generation iPhone have shown up on French sitenowhereelse.fr, and they look quite convincing. 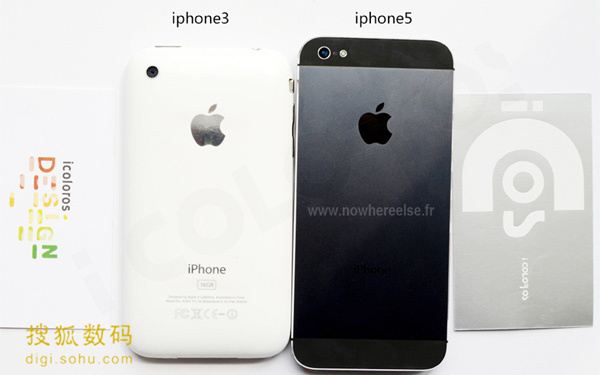 The photos show the “iPhone 5″ compared with its older brethren, the iPhone 4 and the iPhone 3GS. The new model is longer than both and substantially thinner than the iPhone 4. There’s no way of knowing for sure if the photos are real, but the physical characteristics of the “iPhone 5″ in the photos fall in line with most of the rumors we’ve heard about the device — larger screen, thinner profile and a smaller dock connector. Though nothing has been officially confirmed yet, Apple is expected to unveil the next-gen iPhone on September 12, with September 21 being a likely availability date. What do you think? Are these photos really showing the next-generation iPhone? Share your thoughts in the comments.